Come on in and try Boucherie's newest adventure! We started on the late night streets in our Purple Food Truck, moved our casual fine dinning from the cottage to the Avenue, and now our cajun smokehouse has a patio directly next door to our parent restaurant, serving fresh fruit daiquiris, po boy's, hot boudin links, chicken wings & more, rooted in Louisiana tradition, seated in the city. The Deli Case at our meat market on South Carrollton displays all of our house Smoked Meats, Cured Bacon, Boudin Links, Confit & Terrines made available by the pound, butchered & packaged on site. What's rad about daiqs is figuring out what we can put in a blender with ice and booze and make delicious. What's amazing about the wings is even simpler: smoked wings! We get to toss them with all the spices & flavors this city's imagination has provided us. We have a grand plan for this place. 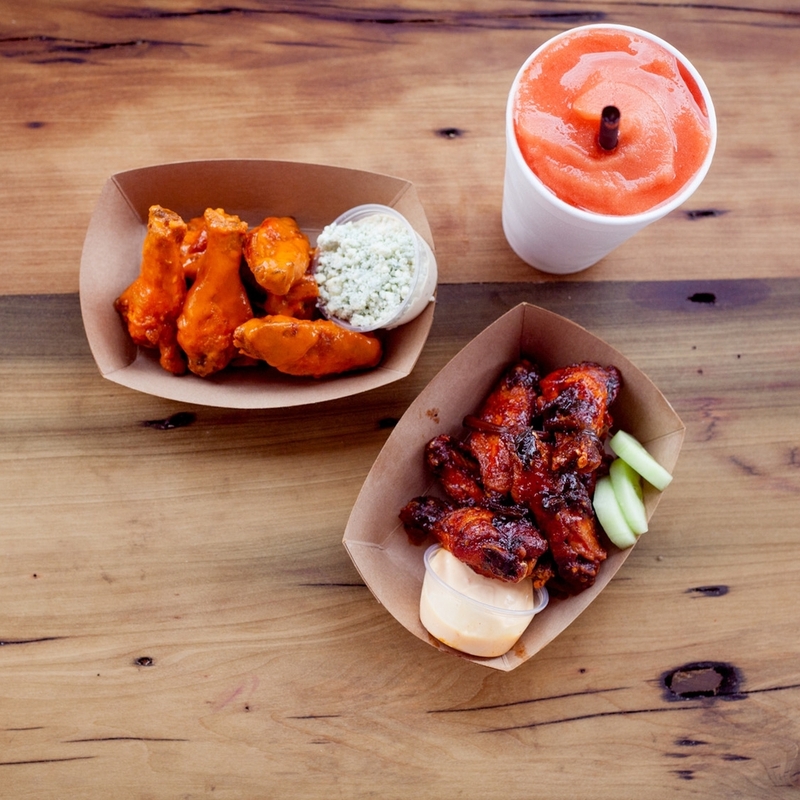 It starts with the Wings and the Daiquiris, but in the months to come we'll be adding to our menu, so keep an eye on us! Strawberries today, honeydew tomorrow, but G&TD forever! Why forever? Because the cucumber we use in our Gin & Tonic Daiquiri can be found in Louisiana all year round. We're using what the seasons provide, and mixing in classics new and old to the blenders as the months turn. 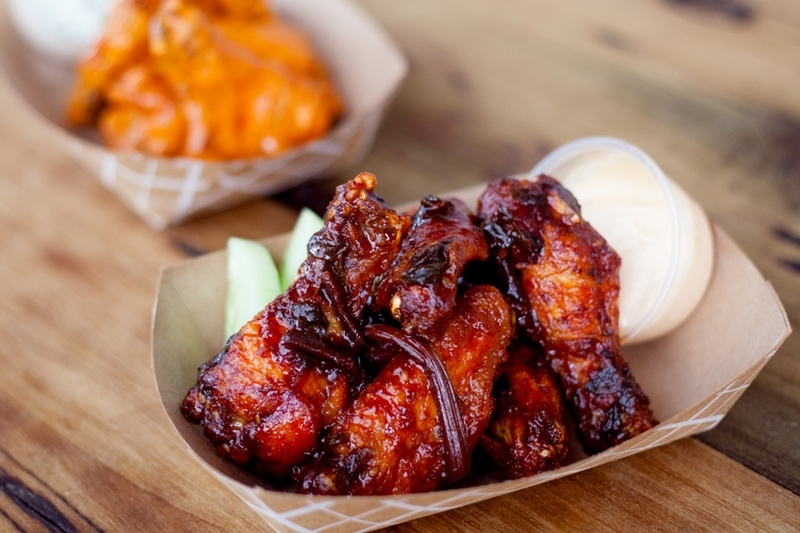 Weather you like them spicy, tossed with our house fermented Kim-Chi or order them dry these are incredible wings. It starts with great chicken, then we smoke them to perfection; each served with their own dipping sauce. We also serve Fresh Cut French Fries & Spicy Boiled Peanuts! Not to mention what's waiting in our cold case. At Bourrée, as well as at Boucherie, we focus on sourcing the best products we can find. We're proud to know we're serving up wings made from one of the highest rated farms in the country, Springer Mountain Farms. "Springer Mountain Farms is proud to say that our chickens are not only "100% All Natural" with "No Steroids or Hormones," but also are produced with NO Antibiotics, are Never Fed Animal By-Products, and are American Humane Association Certified." Located 3 blocks from Oak Street on the South Carrollton Ave. Street Car line. Bourrée's front yard is in renovation to make way for our BEER GARDEN & patio. We'll be BBQing outside on Saturdays, Boiling Crawfish each Sunday, & building planter boxes with hedgerows for trees & other pretty things. Bourrée at Boucherie is located at 1510 South Carrollton Avenue, we started in the Creole cottage that until recently housed our first brick and mortar venture, Boucherie at 8115 Jeannette Street (now reinvented as our event & private dinning space). We've moved into the former Cafe Nino's location directly next door to our parent restaurant on the Avenue.